To many people, pedals such as the Euphoria and Plexi-Drive projected Brian Wampler well on the way to be the king of dirt. This inspired him to take that crown and sit it on the head of distortion to finalize the deal. Wampler took apart what is required for a great distortion, and when they put all the parts back together, they discovered that not only was Brian the King of Dirt, but his new circuit was the king, The Sovereign. With the pedigree this pedal has, Wampler wanted to make sure it stands tall among the other heroes of dirt. 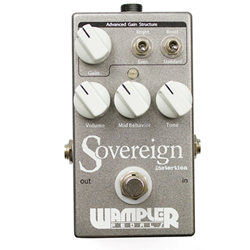 They think the Sovereign is the finest in its class, and with a versatility you won’t find on another pedal that sounds as organic as the Sovereign, you’ll agree that this truly is the sovereign of distortion.